Spring has come to Church of the Good Shepherd! Behind our pear tree in full-bloom is our beautiful church, and behind that—those characteristic blue skies for which Wichita Falls is renowned. Our Fish Fry was a great success. Thanks to everyone who came out and thanks to Deacon Randy and Stephanie for all your hard work! 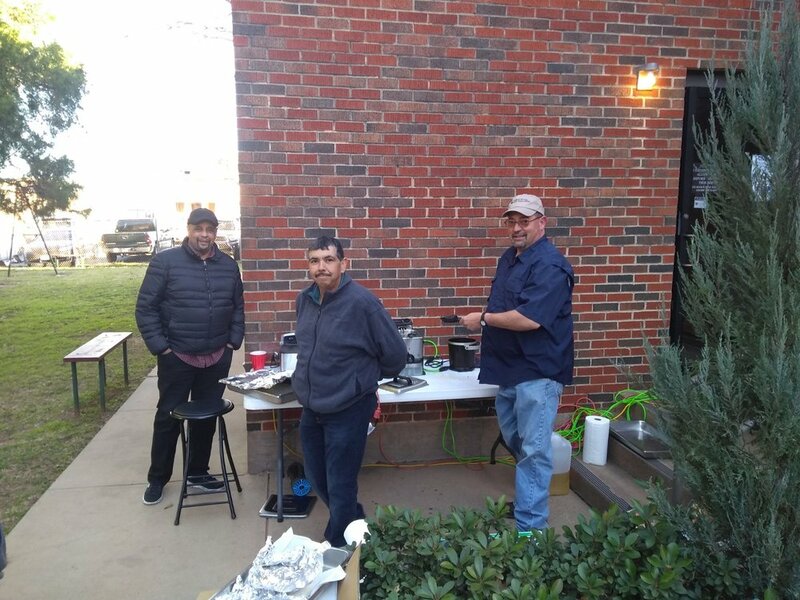 Thanks to the “Fry Guys” for cooking up our fish and chips. The “Memorial” during Mass for the Second Sunday in Lent—worship that impresses a sense of God’s majesty and beauty. One of our children’s catechists presents the “History of the Kingdom of God” to some of our Level 2 children. Catechesis of the Good Shepherd is a Montessori-based approach the children’s spiritual formation. To learn more about our children’s ministry and Catechesis of the Good Shepherd, go to cgsusa.org. We are aware that the image and sound are cutting out at times in the recordings and we are working on the issue, which will require some physical rewiring. Sorry for the inconvenience, and thank you for your patience. Lenten Alms: Every Sunday throughout Lent this year every bulletin will be stuffed with a colored envelope. Any money offered in one of these envelopes will be used for the church’s Benevolence Fund. This fund is used specifically to help our own parishioners who find themselves in a time of difficulty, or need. Stations of the Cross: Stations of the Cross will be offered every Friday in Lent beginning at 5:00. All are welcome. Lenten Feria Mass: Wednesday, 3/20 at 4:30 pm in the chapel (2019 BCP, Sarum Use), commemorating St. Cuthbert, Bishop and Missionary, d. 687; also commemorating St. Patrick, Bishop and Apostle to the Irish, d. 461 (transf. 3/17); St. Cyril of Jerusalem, Patriarch and Doctor, d. 386 (transf. 3/18); St. Joseph, Spouse of Mary, d. 1st cent. (transf. 3/19); St. Thomas Cranmer, Archbishop and Martyr, d. 1556 (transf. 3/21); St. Gregory the Illuminator, Bishop, d. 332 (transf. 3/23). Sign up here with your email address to receive blog posts by email.